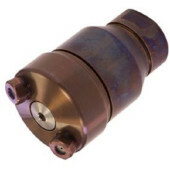 Abrasive waterjet surface prep and cleaning nozzle features an integral check valve to prevent clogging of abrasive line. Maximum operating pressure: 15,000 psi (1000 bar). Self-rotating surface cleaning nozzle utilizing two straight-pattern, hard-hitting, replaceable nozzles. Spinning on a film of high pressure water, the nozzle has no ball bearings to replace, making field service simple. Operating pressure up to 15,000 psi (1000 bar). Self-rotating surface cleaning nozzle utilizing four straight-pattern, hard-hitting, replaceable nozzles. 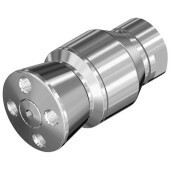 Spinning on a film of high pressure water, the nozzle has no ball bearings to replace, making field service simple. 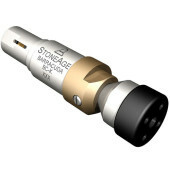 Operating pressure up to 15,000 psi (1000 bar). Self-rotating surface cleaning nozzle. Operating pressures from 10,000 – 20,000 psi (700 – 1400 bar). 4 jet model. Self-rotating surface cleaning nozzle utilizing two straight-pattern, hard-hitting, replaceable nozzles. Spinning on a film of high pressure water, the nozzle has no ball bearings to replace, making field service simple. Operating pressure up to 20,000 psi (1400 bar). 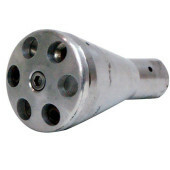 Self-rotating surface cleaning nozzle utilizing four straight-pattern, hard-hitting, replaceable nozzles. Spinning on a film of high pressure water, the nozzle has no ball bearings to replace, making field service simple. Operating pressure up to 20,000 psi (1400 bar). 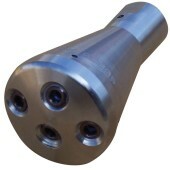 3 jet head for use with the Jetstream Tornado Gun and other air-powered rotary control guns. Operating pressure up to 40,000 psi (2750 bar). 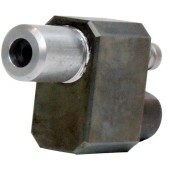 Compact 4 jet staggered pattern head for use with the Jetstream Tornado Gun and other air-powered rotary control guns. Operating pressure up to 40,000 psi (2750 bar). 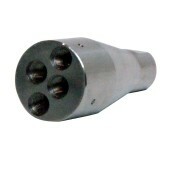 4 jet staggered pattern head for use with the Jetstream Tornado Gun and other air-powered rotary control guns. Operating pressure up to 40,000 psi (2750 bar). Self-rotating surface cleaning nozzle. Flows from 4 – 8 gpm (15 – 30 l/min) at pressures from 28,000 – 40,000 psi (1900 – 2750 bar). Self-rotating surface cleaning nozzle. Flows from 3 – 4 gpm (11 – 15 l/min) at pressures from 28,000 – 40,000 psi (1900 – 2750 bar).